With the weather getting cooler, it’s time to add a vegan sloppy Joe to your menu plan. I’ve made sloppy Joes with tempeh, black eyed peas – but this one is made with cooked beans you can grab from the pantry or your freezer. As you can guess from their title, Sloppy Buffalo Beans, is spicy from Buffalo hot sauce and chilled off with some homemade vegan ranch dressing. There are also little bits of chunky carrots and celery to add some crunch. It’s a bonus that these come together quick! 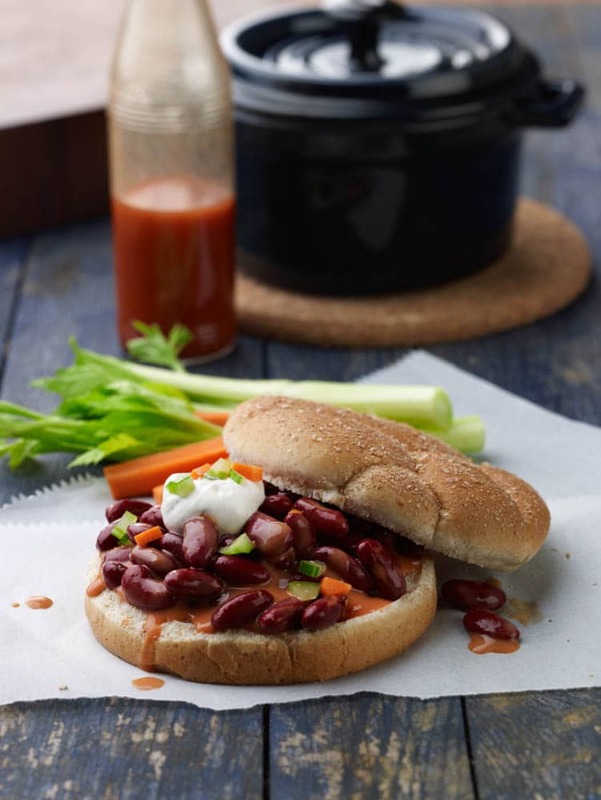 This recipe is from my book, The Great Vegan Bean Book. 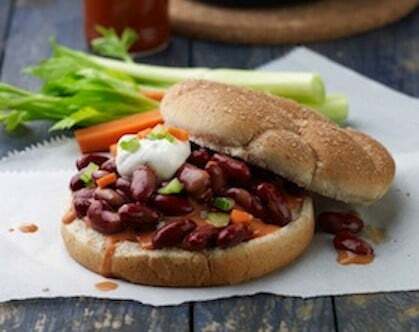 soy-free, gluten-free, oil-free option* This sloppy Joe variation from The Great Vegan Bean Book is a little bit spicy. If you’re family isn’t a fan of heat use less hot sauce or use a milder sauce in its place. To make the dressing, mix all the ingredients and store in the fridge until ready to serve. Add the kidney beans, hot sauce, tomato paste, thyme, liquid smoke, and garlic to a saucepan and cook over medium heat until the garlic mellows, about 5 to 10 minutes. Add the sour cream and heat thoroughly. Serve over the toasted buns open-face style topped with the carrot and celery mixture and the ranch dressing. If you have some unexpected guests, serve as a regular sandwich and the filling will stretch up to eight sandwiches. My go to sloppy joe ingredient is usually brown lentils, but that said, I love beans. I’m kind of a bean fanatic. Love beans in any way, shape or form. I’d love to win your book. Thanks. I love love love buffalo sauce! This sounds so yummy! Guess what’s for dinner tonight!! I’ve never had a sloppy joe before. Would love to win your book. I’ve used lentils, pinto beans, and blackeye peas to make sloppy joe mixtures. I’ll have to try this recipe. I would like to be included in you drawing. i have never had a sloppy joe. I would love to win the book and learn new recipes for beans. Thank you for a wonder website and for many delicious recipes. I have borrowed your Vegan Bean book from our local library a number or times in the last few months and it would be very nice to own a copy. I have made many of your recipes over the last few years. I like them because generally I have the ingredients on hand and so no special purchases are necessary. I borrowed your book from my local library and loved it. I would love to win a copy of my own! I have just recently found your website and I bought your Oatrageous Oatmeals book a few weeks ago. I have tried about 12 recipes so far and either liked or loved them all. In fact, my kids have been checking on every single dish I make to see if their are oats hidden in it everywhere. They are enjoying it as much as I am, which is why I think we would love to have a copy of your book. They will be asking me soon enough if their are beans hidden in everything! If you get a chance I’d love it if you’d review the book on Amazon! I don’t see any instructions about how to enter the giveaway but would like to enter — I eat beans just about every day and your book looks like a wonderful resource! You are right I left the rafflecopter off! I will pull a winner from these comments next week and announce the winner in the comments for them to get in touch with me for mailing details. I just found out last week that great northern beans are great for quick pre-soaking. They work better that way than any other bean I’ve tried. Do you have any great northern bean recipes in your book? I call for white beans a ton. You can use cannellini beans, navy, great northern – your choice. They can all be subbed for each other.